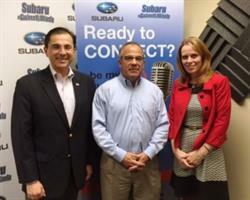 DULUTH, GA--(Marketwired - February 17, 2016) - On January 28, 2016, On The Money Radio welcomed to the studio Alfredo Ortiz and Elaine Lutz with Job Creators Network. Host Joe Moss led these guests in a discussion regarding educating employers and employees. Job Creators Network (JCN) is a nonpartisan organization founded by entrepreneurs like Home Depot co-founder Bernie Marcus who believe the best defense against bad government policy is a well-informed public. "Bernie Marcus started with one store in Atlanta," explained Ortiz. "He was a small business owner. He believes that if he ever tried to recreate Home Depot today, he wouldn't be able to be successful in this environment of over-regulation and over-taxation. He founded JCN because of his concern that small business owners wouldn't be able to repeat the success he had." JCN's nonpartisan E2E program is strictly focused on empowering individuals through basic public policy education. JCN strongly supports the right of every employee to empower themselves with as much public policy information as possible, and more importantly the right of every individual to think for themselves and make their own private decisions regarding what to do with that information. The JCN E2E program gives employers simple tools to talk to their employees about government policy. They break things down with easy to understand videos, blog posts, infographics and social media posts. All of it can be easily viewed at InformationStation.org. To learn more about the Job Creators Network, listen to the entire interview at On The Money. On The Money focuses on topics and issues allowing small businesses to better navigate the financial services minefield, with analysis and opinions from today's industry experts on banking and loans. On The Money introduces listeners to some of the top small business leaders in the Atlanta market. Hosted by Joe Moss and sponsored by Embassy National Bank, On The Money airs live every Wednesday at 3:00 PM Eastern from the Gwinnett Business RadioX® studio.